This blog post describes the basics of Crunch compression and explains in details how the original Crunch algorithm was modified in order to be able to compress ETC1 and ETC2 textures. Introduction to Crunch: Compressing DXT textures. 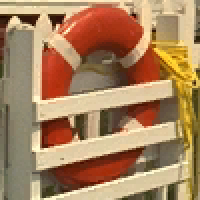 Crunch is an open source texture compression library © Richard Geldreich, Jr. and Binomial LLC, available on GitHub. 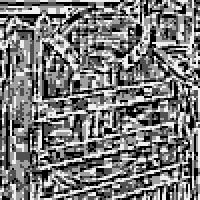 The library was originally designed for compression of DXT textures. The following section describes the main ideas used in the original algorithm. 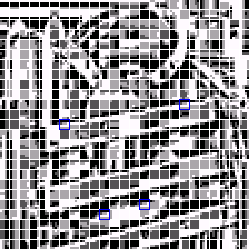 Each pixel can be decoded by merging together color0 and color1 values according to the selector value. Of course, the described chunk types don’t cover all the possible combinations of matching endpoints, but at the same time, this way the information about the matching endpoints can be encoded very efficiently. Specifically, encoding of the chunk type requires 3 bits per 4 blocks (0.75 bits per block, uncompressed). Crunch algorithm can enforce the neighbor blocks within a chunk to have identical endpoints in cases when extra accuracy of the encoded colors isn’t worth spending extra bits for encoding of additional endpoints. This is achieved in the following way. 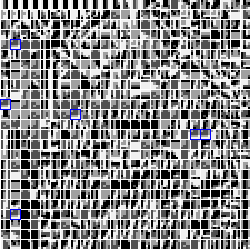 First, each chunk is encoded in 8 different ways, corresponding to the described 8 chunk types (instead of using DXT1 optimization for each block, the algorithm is using DXT1 optimization for each tile). The quality of each encoding is then evaluated as the PSNR multiplied by a coefficient associated with the used chunk type, and the optimal encoding is selected. The trick here is that chunk types with higher number of matching endpoints also have higher quality coefficients. In other words, if using the same endpoint for two neighbor blocks within a chunk doesn’t reduce the PSNR much, then the algorithm will most likely select the chunk type where those neighbor blocks belong to the same tile. The described process can be referenced as «tiling». The basic idea of Crunch compression is to perform quantization of the determined endpoints and selectors blocks, in order to encode them more efficiently. This is achieved using vector quantization. The idea is similar to color quantization, when a color image is represented using a color palette and palette indices defined for each pixel. In order to perform vector quantization, each endpoint pair should be represented with a vector. For example, it is possible represent a tile endpoint pair with a vector (color0.r, color0.g, color0.b, color1.r, color1.g, color1.b), where color0 and color1 are obtained from DXT1 optimization. However, such representation doesn’t reflect the continuity properties of the source texture very well (for example, in case of a solid block, a small change of the block color might result in significant change of the optimal color0 and color1, which are used to encode this color). Instead, Crunch algorithm is using a different representation. Source pixels of each tile, which are represented by their (r, g, b) vectors, are split into 2 clusters using vector quantization, providing two centroids for each tile: low_color and high_color. Then the endpoints of each tile are represented with a (low_color.r, low_color.g, low_color.b, high_color.r, high_color.g, high_color.b) vector. Such representation of the tile endpoints doesn’t depend on the DXT1 optimization result, but at the same time performs quite well. Note that after quantization all the blocks within a tile will be associated with the same endpoint codebook element, so they will get assigned the same endpoint index. This means that initially determined chunk types will be still valid after endpoint quantization. Vector quantization algorithm splits all the input vectors into separate groups (clusters) in such a way so that vectors in each group appear to be more or less similar. Each group is represented by its centroid, which is computed as an average of all the vectors in the group according to the selected metric. The computed centroid vectors are then used to generate the codebook (centroid vector components are clipped and rounded to integers in order to represent valid endpoints or selectors). The original texture elements are then replaced with the elements of the computed codebooks (endpoints for each source 4×4 block are replaced with the closest endpoint pair from the generated endpoint codebook, selectors for each source 4×4 block are replaced with the selector values of the closest selector codebook element). The quality parameter provided for Crunch compressor directly controls the size of generated endpoint and selector codebooks. The higher is the quality value, the larger are the endpoint and selector codebooks, the wider is the range of the possible indices, and subsequently, the bigger is the size of the compressed texture. Vector quantization for the alpha channel is performed exactly the same way as for the color components, except that vectors which represent alpha endpoints of each tile, consist of 2 components (low_alpha, high_alpha), and are obtained through clusterization of the alpha values of all the tile pixels. Note that the chunk type, determined during the tiling step, is common for both color and alpha endpoints. So in case of textures using alpha channel, chunk type is determined based on the combined PSNR computed for color and alpha components. The main idea used in Crunch algorithm for improving the compression ratio is based on the fact that changing the order of the elements in the codebook doesn’t affect the decompression result (considering that the indices are reassigned accordingly). In other words, the elements of the generated codebooks can be reordered in such a way, so that the dictionary elements and indices acquire some specific properties, which allow them to be compressed more efficiently. Specifically, if the neighbor encoded elements appear to be similar, then each element can be used for prediction of the following element, which significantly improves the compression ratio. According to this scheme, Crunch algorithm is using zero order prediction when encoding codebook elements and indices. Instead of encoding endpoint and selector indices, the algorithm encodes the deltas between the indices of the neighbor encoded blocks. The codebook elements are encoded using per-component prediction. Specifically, each endpoint codebook element (which is represented by two RGB565 colors) is encoded as 6 per-component deltas from the previous dictionary element. Each selector codebook element (which is represented by 16 2-bit selector values) is encoded as 16 per-component deltas from the previous dictionary element. On the one hand, endpoint indices of the neighbor blocks should be similar, as the encoder compresses the deltas between the indices of the neighbour blocks. On the other hand, the neighbor codebook elements should be also similar, as the encoder compresses the deltas between the components of those neighbor codebook elements. The combined optimization is based on the Zeng’s technique, using a weighted function which takes into account both similarity of the indices of the neighbor blocks and similarity of the neighbor elements in the codebook. Such reordering optimization is performed both for endpoint and selector codebooks. Finally, the reordered codebooks and indices, along with the chunk type information, are encoded with Huffman coding (using zero order prediction for indices and codebook components). Each type of encoded data uses its own Huffman table, or multiple tables. For performance reasons adaptive Huffman coding isn’t used. We performed a comprehensive analysis of the algorithms and techniques used in the original version of Crunch and introduced several modifications which allowed us to significantly improve the compression performance. The updated Crunch library, introduced in Unity 2017.3, can compress DXT textures up to 2.5 times faster, while providing about 10% better compression ratio. At the same time, decompressed textures, generated by both libraries, are identical bit by bit. The latest version of the library, which will reach Beta builds soon, will be able to perform Crunch compression of DXT textures about 5 times faster than the original version. The latest version of the Crunch library can be found in the following GitHub repository. The main modifications of the original Crunch library are described below. The improvement in compressed size and compression time, introduced by each modification, is described as a saved portion of the compressed size and compression time spent by the original library. It has been evaluated on the Kodak image test set. When compressing real world textures, the improvement in compression size should be normally higher. Note that the modified Crunch encoding is a superset of the original encoding, so all the images previously encoded with the original Crunch algorithm can be losslessly transcoded into the new format, but not vice versa. Even though the new endpoint equality encoding is more expensive (about 1.58 bits per block, uncompressed), it also provides more flexibility for endpoint matching inside the previously used “chunks”, but more importantly, it allows to copy endpoints from one “chunk” to another (which isn’t possible when using the original chunk encoding). The blocks are no longer grouped together and are encoded in the same order as they appear on the image, which significantly simplifies the algorithm and eliminates extra levels of indirection. The original version of Crunch encodes the deltas between the neighbour indices in order to get advantage of the neighbour indices similarity. The efficiency of such approach highly depends on the continuity of the encoded data. While neighbour color and alpha endpoints are usually similar, this is often not the case for selectors. Of course, in some situations, encoding the deltas for selector indices makes sense, for example, when an image contains a lot of regular patterns aligned to the 4×4 block boundaries. In practice, however, such situations are relatively rare, so it usually appears to be more efficient to encode raw selector indices without prediction. Note that when selector indices are encoded without prediction, the reordering of the selector indices no longer affects the size of the encoded selector indices stream (at least when using Huffman coding). This makes the Zeng optimization of selector indices unnecessary, and it’s sufficient to simply optimize the size of the packed selector codebook. 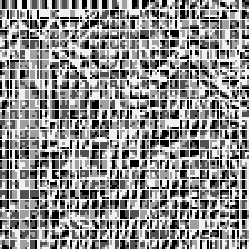 By default, the size of the endpoint and selector codebooks is calculated based on the total number of blocks in the image and the quality parameter, while the actual complexity of the image isn’t evaluated and isn’t taken into account. The target codebook size is selected in such a way that even complex images can be approximated well enough. 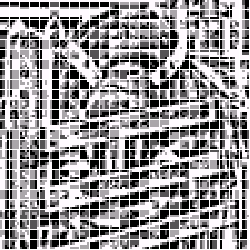 At the same time, normally, the lower the complexity of the image, the higher is the density of the quantized vectors. Considering that vector quantization is performed using floating point computations, and the quantized endpoints have integer components, high density of quantized vectors will result in a large number of duplicate endpoints. As the result, some identical endpoints are being represented with multiple different indices, which affects the compression ratio. Note that this isn’t the case for selectors, as their corresponding vector components are rounded after quantization, but instead it leads to some duplicate selectors in the codebook being unused. In the modified version of the algorithm all the duplicate codebook entries are merged together, unused entries are removed from the codebooks, endpoint and selector indices are updated accordingly. In the original version of Crunch, selector codebook is encoded with Huffman coding applied to the raw deltas between corresponding pixel selectors of the neighbour codebook elements. However, using Huffman coding for raw deltas has a downside. Specifically, for each individual pixel selector, only about half of all the possible raw deltas are valid. Indeed, once the value of the current selector is determined, the selector delta depends only on the next selector value, so only n out of 2 * n — 1 total raw delta values are possible at any specific point (where n is the number of possible selector values). This means that on each step the impossible raw delta values are being encoded with a non-zero probability, as the probability table is calculated only once throughout the whole codebook. The situation can be improved by using modulo-deltas instead of raw deltas (modulo 4 for color selectors and modulo 8 for alpha selectors). This eliminates the mentioned implicit restriction on the values of the decoded selector deltas, and therefore improves the compression ratio. Interestingly, the compression ratio can be improved even further if XOR-deltas are used instead of modulo-deltas (XOR-delta is computed by simply XOR-ing two selector values). At first it might seem counterintuitive that XOR-delta can perform better than modulo-delta, as it doesn’t reflect the continuity properties of the data that well. The trick here is that the encoded selectors are first sorted according to the used delta operation and the corresponding metric. After the endpoint codebook has been computed, the endpoints are reordered to improve the compression ratio. As has been described above, optimization is based on Zeng’s technique, using a weighted function which takes into account both similarity of the indices in neighbor blocks and similarity of the neighbor elements in the codebook. Additional improvement in compression speed has been achieved by optimizing the original algorithms, reducing the total amount of computations by caching the intermediate computation results, and spreading the computations between threads more efficiently. According to the test results, it seems to be more efficient to use Crunch encoding of the computed codebooks and indices, rather than compress the quantized texture with LZMA. Not to mention that Crunch decompression is also significantly faster than LZMA decompression. Even though the Crunch algorithm was originally designed for compression of DXT textures, it is in fact much more powerful. With some minor adjustments it can be used to compress other texture formats. This section will describe in detail how the original Crunch algorithm was modified in order to be able to compress ETC and ETC2 textures. ETC is a block-based texture compression format. 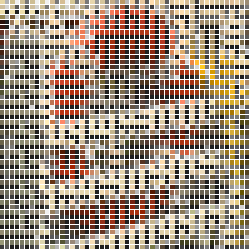 The image is split up into 4×4 blocks, and each block is encoded using a fixed number of bits. In case of ETC1 format (used for compression of RGB images), each block is encoded using 64 bits. The first 32 bits contain information about the colors used within the 4×4 block. Each 4×4 block is split either vertically or horizontally into two 2×4 or 4×2 subblocks (the orientation of each block is controlled by the “flip” bit). Each subblock is assigned its own base color and its own modifier table index. The two base colors of a 4×4 block can be encoded either individually as RGB444, or differentially (the first base color is encoded as RGB555, and the second base color is encoded as RGB333 signed offset from the first base color). The type of the base color encoding for each block is controlled by the “diff” bit. Note that the higher is the value of the modifier table index, the more distributed are the subblock colors along the intensity axis. 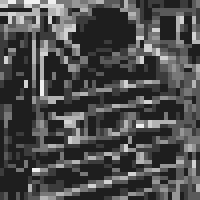 Another 32 bits of the encoded ETC1 block describe 16 2-bit selectors values (each pixel in the block can take one of 4 possible color values, described above). Each pixel color of an ETC1 block can be decoded by adding together the base color and the modifier color, defined by the modifier table index and selector value (the result color should be clamped). The detailed description of ETC1 format can be found at this Khronos Group page. Even though DXT1 and ETC1 encodings seem to be quite different, they also have a lot in common. Each pixel of an ETC1 texture can take one of four possible color values, which means that ETC1 selector encoding is equivalent to DXT1 selector encoding, and therefore ETC1 selectors can be quantized exactly the same way as DXT1 selectors. The main difference between the encodings is that in case of ETC1, each half of a 4×4 block has its own set of possible color values. But even though ETC1 subblock colors are encoded using a base color and a modifier table index, the four computed subblock colors normally lie on the same line and are more or less evenly distributed along that line, which highly resembles DXT1 block colors. The described similarities allow to use Crunch compression for ETC1 textures, with some modifications. When applying Crunch algorithms to a new texture format, it is necessary to first define the codebook element. 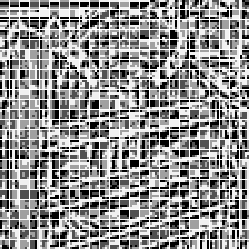 In the context of Crunch, this means that the whole image consists of smaller non-overlapping blocks, while the contents of each individual block are determined by an endpoint and a selector from the corresponding codebooks. For example, in case of DXT format, each endpoint and selector codebook element corresponds to a 4×4 pixel block. In general, the size of the blocks, which form the encoded image, depends on the texture format and quality considerations. Codebook elements should be compatible with the existing Crunch algorithm, while the image blocks defined by those codebook elements should be compatible with the texture encoding format. In case of ETC1, the texture format itself determines the minimal size of the image block, defined by an endpoint: it can be either 2×4 or 4×2 rectangle, aligned to the borders of the 4×4 grid. It isn’t possible to use higher granularity, because each of those rectangles can have only one base color, according to the ETC1 format. For the same reason, any image block, defined by an endpoint codebook element, should represent a combination of ETC1 subblocks. At the same time, each ETC1 subblock has its own base color and modifier table index, which approximately determine the high and the low colors of the subblock (even though there are some limitations on the position of those high and low colors, implied by the ETC1 encoding). If an endpoint codebook element is defined in such a way that it contains information about more than one ETC1 base color, then such a dictionary will become incompatible with the existing tile quantization algorithm for the following reason. The Crunch tiling algorithm first performs quantization of all the tile pixel colors, down to just 2 colors. 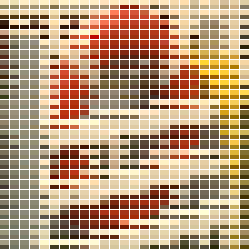 Then it performs quantization of all the generated color pairs, generated by different tiles. This approach works quite well for 4×4 DXT blocks, as those 2 colors approximately represent the principal component of the tile pixel colors. In case of ETC1, however, mixing together pixels, which correspond to different base colors, doesn’t make much sense, because each group of those pixels has its own low and high color values independent from other groups. 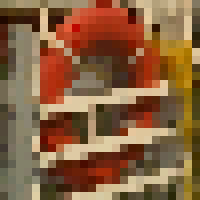 If those pixels are mixed together, the information about the original principal components of each subblock will get lost. The described limitations suggest that ETC1 endpoint codebook element should represent the area of a single ETC1 subblock (either 2×4 or 4×2). This means that ETC1 endpoint codebook element should contain information about the subblock base color (RGB444 or RGB555) and the modifier table index (3 bits). And it is therefore proposed to encode an ETC1 “endpoint” as 3555 (3 bits for the modifier table index and 5 bits for each component of the base color). In case of DXT format, both endpoint codebook elements and selector codebook elements correspond to the same size of the decoded block (in case of DXT it is 4×4). So it would be reasonable to try the same scheme for ETC1 encoding (i.e. to use 2×4 or 4×2 blocks for selector codebooks, matching the blocks which are defined by endpoint codebook elements). Nevertheless, after additional research we discovered a very interesting observation. Specifically, endpoint blocks and selector blocks don’t have to be of the same size in order to be compatible with the existing Crunch algorithm. Indeed, selector codebook and selector indices are defined after the endpoint optimization is complete. At this point each image pixel is already associated with a specific endpoint. At the same time, the selector computation step is using those per-pixel endpoint associations as the only input information, so the size and the shape of the blocks, defined by selector codebook elements, doesn’t depend in any way on the size or shape of the blocks, defined by endpoint codebook elements. In other words, the endpoint space of the texture can be split into one set of blocks, defined by endpoint codebook and endpoint indices. And the selector space of the texture can be split into a completely different set of blocks, defined by selector codebook and selector indices. Endpoint blocks can be different in size from the selector blocks, as well as endpoint blocks can overlap in arbitrary way with the selector blocks, and such setup will still be fully compatible with the existing Crunch algorithm. The discovered property of the Crunch algorithm opens another dimension for optimization of the compression ratio. Specifically, the quality of the compressed selectors can now be adjusted in two ways: by changing the size of the selector codebook and by changing the size of the selector block. Note that both DXT and ETC formats have selectors encoded as plain bits in the output format, so there is no limitation on the size or shape of the selector block (though, for performance reasons, non-power-of-two selector blocks might require some specific optimizations in the decoder). Several performance tests have been conducted using different selector block sizes, and the results suggest that 4×4 selector blocks perform quite well. Note that decoded selectors should be flipped back according to the block orientation during decompression (this can be efficiently implemented by precomputing a codebook of flipped selectors). In addition to the standard endpoint references (to the top and to the left blocks), it is also possible to use an endpoint reference to the top-left diagonal neighbour block. Endpoint references for the primary and secondary subblocks have different meaning. Considering that each endpoint codebook element corresponds to a single ETC1 base color, the original endpoint quantization algorithm works almost the same way for the ETC1 encoding as for the DXT1 encoding. 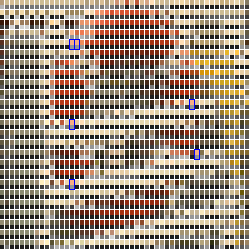 An endpoint of en ETC1 tile can be represented with a (low_color.r, low_color.g, low_color.b, high_color.r, high_color.g, high_color.b) vector, where low_color and high_color are generated by the tile palletizer, exactly the same way as for the DXT1 encoding. Note that low_color and high_color, computed for a tile, implicitly contain information about the base color and the modifier table index, computed for this tile. Indeed, the base color normally lies somewhere in the middle between low_color and high_color, while the modifier table index corresponds to the distance between low_color and high_color. Vectors which represent tiles with close values of low_color and high_color, will most likely get into the same cluster after vector quantization. But this also means that for the tiles from the same cluster, the average values of low_color and high_color, and distances between low_color and high_color should be also pretty close. In other words, the original endpoint quantization algorithm will generate tile clusters with close values of the base color and the modifier table index. 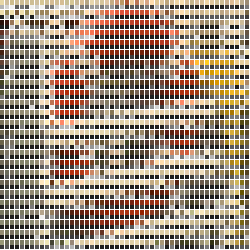 Selectors of each 4×4 block can be represented with a vector of 16 components, corresponding to the selector values of each block pixel. This means that ETC1 selector quantization step is identical to the DXT1 selector quantization step. Note that according to the ETC1 format, the base colors within an ETC1 block can be encoded either as RGB444 and RGB444, or differentially as RGB555 and RGB333. For simplicity, this aspect is currently not taken into account (all the quantized endpoints are encoded as 3555 in the codebook). If it appears that the base colors in the resulting ETC1 block can not be encoded differentially, the decoder will convert both base colors from RGB555 to RGB444 during decompression. The Crunch algorithm doesn’t yet support ETC2 specific modes (T, H or P), but it’s capable of efficiently encoding the ETC2 Alpha channel. This means that the current ETC2 + Alpha compression format is equivalent to ETC1 + Alpha. Note that ETC2 encoding is a superset of ETC1, so any texture, which consists of ETC1 color blocks and ETC2 Alpha blocks, can be correctly decoded by an ETC2_RGBA8 decoder. ETC2 encoding for the alpha channel is very similar to the ETC1 encoding of the color information. Information about the alpha channel of each block is stored using 64 bits: 8-bit base alpha, 4-bit modifier table index, 4-bit multiplier and 16 3-bit selector values (one selector value per pixel). The final alpha value for each pixel is calculated as base_alpha + modifier * multiplier, which is then clamped. 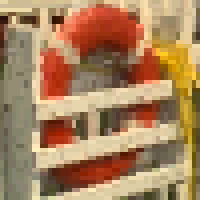 Note that unlike ETC1 color, ETC2 Alpha is encoded using a single base alpha value per 4×4 pixel block. This means that each element of the alpha endpoint dictionary should correspond to a 4×4 pixel block, covering both primary and secondary ETC1 subblocks. For this reason, alpha channel can be ignored when performing color endpoint tiling. The compression scheme for ETC2 Alpha blocks is equivalent to the compression scheme for DXT5 Alpha blocks. As has been shown before, vector representation of alpha endpoints doesn’t depend on the used encoding. This means that all the initial processing steps, including alpha endpoint quantization, will be almost identical for DXT5 and ETC2 Alpha channels. The only part which is actually different for the ETC2 Alpha encoding is the final Alpha endpoint optimization step. In order to perform ETC2 Alpha endpoint optimization, the already existing DXT5 Alpha endpoint optimization algorithm is run to obtain the initial approximate solution. Then the approximate solution is refined based on the ETC2 Alpha modifier table values. Note that ETC2 format supports 16 different Alpha modifier indices, but for performance reasons, only 2 Alpha modifier indices are currently used: modifier index 13, which allows to perform precise approximation on short Alpha intervals, and modifier index 11, which has more or less regularly distributed values, and is used for large Alpha intervals. At first it might seem that different size of the color and alpha blocks can bring some complications for Crunch, as according to the original algorithm, both color and alpha endpoints should share the same endpoint references. This, however, is easily resolved in the following way: each alpha block is using the endpoint reference of the corresponding primary color subblock (this allows to copy alpha endpoint from the left, top, left-top or from the input stream), while the endpoint reference of the secondary color subblock is simply ignored when decoding alpha channel. The performed research demonstrates that Crunch compression algorithm in not limited to the DXT format and with some modifications can be used on a different gpu texture formats. We see some research potential to expand this work to cover further texture formats in the future. We developers appreciate technical details like this. Awesome post! How about ASTC? Would it be possible and what kind of changes it would need? I think it should be possible to use Crunch compression for ASTC format as well. However, due to the nature of the ASTC format, the improvement in compressed size might be not as big as in case of DXT or ETC. Specifically, in case of DXT and ETC you just need the quantization step to provide better quality than downscaling, while in case of ASTC you also have freedom to change the size of the block. Awesome article! So glad to see such deep technical information here. From that great blog post, i’ve gotten then idea that if you can, you should use crunch mode over the other ones. Smaller file and faster to decompress. Is there a case where i would NOT want to use crunch mode? Is there a use case that would kill my build on a device like an android midrange phone? If a device supports DXT or ETC texture formats, then you should also be able to use crunched versions of those formats of such device. Note that Crunch compression helps to reduce the build size of your game at the expense of reduced image quality. So if there are some textures in your game that need to be displayed in higher quality, you can either disable Crunch compression for those textures, or adjust the Crunch quality parameter accordingly. I think it’s worth noting, if you use crunch compression, you probably don’t want to use (LZMA) compression on top of that for your asset bundle(s) where those crunched textures are stored in. Yes, exactly. If your textures are already compressed with Crunch, you don’t need to use any additional compression on top of it. However, in some cases you might be interested in using a general purpose compression algorithm like LZMA for textures which have been quantized with Crunch but not yet encoded with Crunch (in which case you don’t need to perform Crunch decompression at runtime). You can think of a quantized texture as of a texture that has been compressed with Crunch and then decompressed back to the original gpu format (even though such a texture now uses the original gpu format, some image information has been lost during quantization, which improves the compression ratio). So much detail in a Blog! Very impressed by the techniques and also the blog writing effort by Alexander. Its a bit to complex for me but I get the general idea. Aldo different it brings back memories of the HAM (Hold And Modify) system on the Amiga witch created 4096 colors with limited memory. It had its down site as pixel colors where depended on the pixel before that one making changes hard. 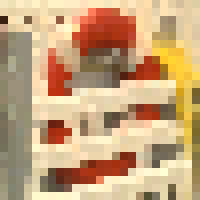 (As changing one pixel color would effect the hole row of pixels after it.) It was hard to make a HAM resolution game in Amiga.